Born in the capital of Sarawak, Borneo, the author, Jian as a kid was interested in drawing and designing. However at the insistence of the father, pursued an engineering degree while still continued with his hobby. It was during an assignment course at his University, Jian was introduced to the world of blogging which eventually led him to create his first digital version of the Miao character, a marmalade cat with his computer mouse. An incident in Jian’s life prompted him to flesh out Miao in a comic strip. 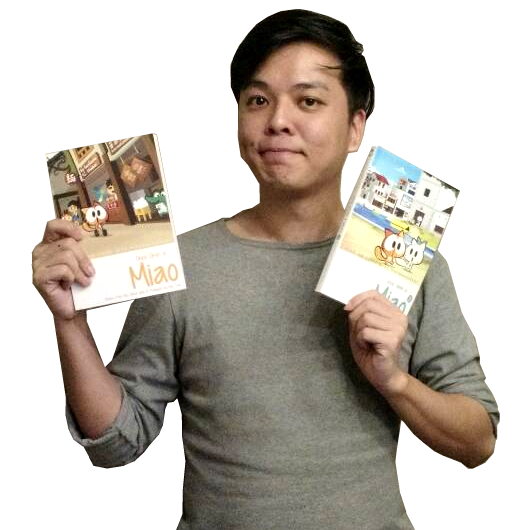 The good response from his fans prompted Jian to develop more Miao webcomics and products. After graduation, Jian stayed in Malacca and worked as a R&D engineer while he continued to draw as a hobby. After 5 years of drawing it as a hobby, he went full time on Miao&WafuPafu to pursuit this dream of his. Now, the 12 years old Miao&WafuPafu since 2007 is about life storytelling in a comical way.